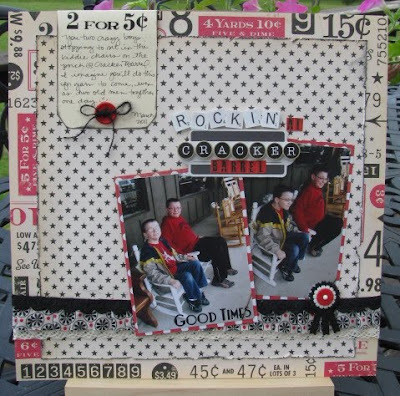 The Polka Dot Whimsy kits come FULL of amazing papers and embellishments. Recently I was able to complete three more layouts with the "leftovers" of my April main kit. This first layout - Happy Feet - is a true "blackmail page." Over spring break, we stopped at a Zappos outlet on the way to Louisville one day. I was in awe of all the shoes and admit I wasn't paying close attention to the boys. I turned around to find Blake goofing off in high heels. I can't believe he allowed me to take his photo! One of these days it will come back to haunt him. 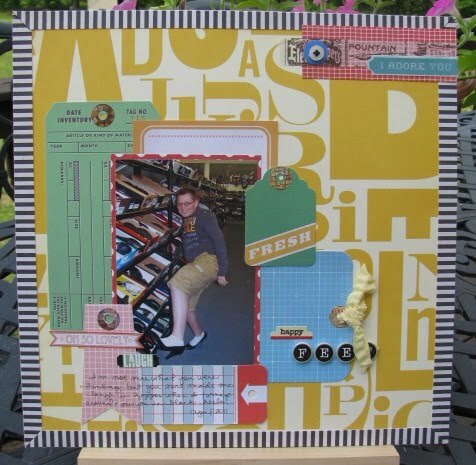 I liked the designs of the Studio Calico tags in the kit so much that I used several as a background behind my photo and used them for my journaling and title placement, too. I love how adding pop dots behind the Echo Park round alphas makes them look like real vintage typewriter keys. The Studio Calico papers in the kit were my favorite. I loved the honeycomb-looking pattern and hand cut a section out. I also cut a few of the centers out of the honeycomb paper and added them with pop dots. Originally, I wasn't going to use a journaling box, but I made a mistake on my journaling directly on the page and had to add the journaling box (cut from the Studio Calico tags packaging) to fix it. I used excess of the honeycomb-patterned paper layered with a strip of pattern paper and some tickets to make a corner accent. Buttons come in every PDW kit and I loved how perfectly the blue button fit inside the larger white one. It was a cute little extra touch. Today is my day to post on the PDW blog for Inspiration Wednesday. My inspiration was Cracker Barrel - yes, the restaurant. When I saw the 5 & Dime October Afternoon paper, I thought of the old country store at Cracker Barrel. Then I remembered I actually had photos of the boys in rocking chairs on the porch from a recent stop. I layered fabric and trim on my page. LOVE that Jenni Bowlin ribbon! The kit came with a couple stamped shipping tags, but the images didn't fit this page, so I folded the tag over the top of the layout and used it for journaling. I'm hoping my May kit will arrive soon. I can't wait to work with it! Lots of creativity going on here, Amy! Love the layouts. I'm wondering if I have those nesting buttons . . .